perfect way to be yourself - to begin the journey. A wide range of RVs are spacious enough for your belongings, family, and even pets. As you bond with loved ones on the road, getting there is half the fun. 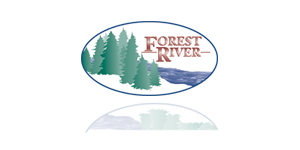 Forest River's recreational vehicles offer an ideal winning formula. They let you reinvent the roadmap and yourself in the process every time. You choose your perfect hideaway by choosing your destinations instead of them choosing you. A wide range of RVs are spacious enough for your belongings, family, and even pets. As you bond with loved ones on the road, getting there is half the fun. Coachmen RV has manufacturing facilities in Indiana and Michigan for its Coachmen branded Class A Motorhomes, Class C Motorhomes, Fifth Wheels, Travel Trailers, Destination Trailers and Camping Trailers. With significant product advantages, leading quality, and unparalleled value, the Coachmen Brand remains one of the most recognized brands throughout the RV Industry! From its inception, the prestigious Dynamax brand has been set apart with a vision driven by pursuit of precision and quality performing at a high standard of excellence. Dynamax products are aesthetically appealing and structurally solid with revolutionary curved sidewalls, eye catching paint schemes and sleek styling. Forest River, Inc., was launched in 1996 and initially manufactured pop-up tent campers, travel trailers, fifth wheels and park models. It has now expanded into producing motorized Class A, B and Cs, travel destination trailers, cargo trailers, commercial vehicles, buses, pontoons, and restroom trailers. Headquarted in Wakarusa, Indiana, Prime Time Manufacturing proudly builds a full line of towable RV products. With over 100 years of manufacturing experience, each member of our management team has diverse, yet complimentary, expertise which provides the foundation that Prime Time utilizes to create our customer-friendly floorplans, dynamic interiors, and innovative features. We invite you to our web site to learn more. Palomino Camping Trailer started operating as a separate division of Forest River, Inc., after its purchase in 2002, allowing for rapid growth and new facilities to house production of new towable lines of travel trailers and fifth wheels, Puma and Sabre. From its humble beginnings in 1968, Palomino RV has grown to one of the top 5 RV manufacturers in North America with over 300 dealers representing, selling and servicing the Palomino Brand. Shasta RV's respected name prevails because of experience as the industry’s older producer, combined with a strong, service-oriented dealer network, a loyal, repeat-customer base, and outstanding association with its parent company, Forest River. Illustration & explanation of RV types by Forest River.